This is going to be your guide to City Council. Where you sit at Council is crucial, because you’ve got everybody there. The Fords are Toronto royalty. If City Hall were US Weekly, they would always be on the cover. That one there, that’s Rob Ford. He is one of the dumbest politicians you’ll ever meet. He got filmed smoking crack and making bigoted remarks…twice. The yelling one? That’s his brother Doug. They’re totally rich because their dad patented shampoo labels. Doug Ford knows everybody’s business. He knows everything about everyone…well, at least he thinks he does. And evil takes a human form in Giorgio Mammoliti. Don’t be fooled, because he may seem like your typical selfish, back-stabbing, attention-whore sleaze-bag. But in reality, he is so much more than that. 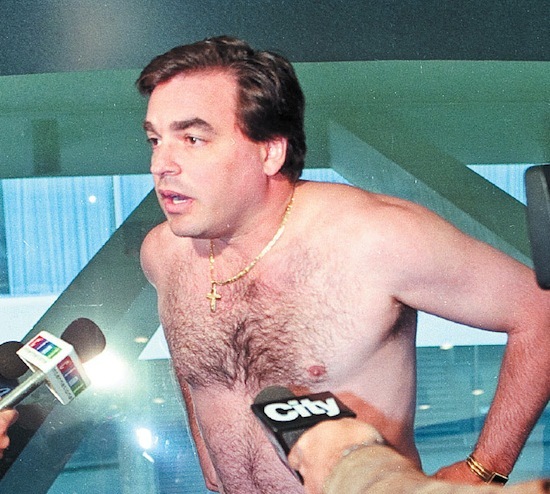 Giorgio Mammoliti…How do I even begin to explain Giorgio Mammoliti?